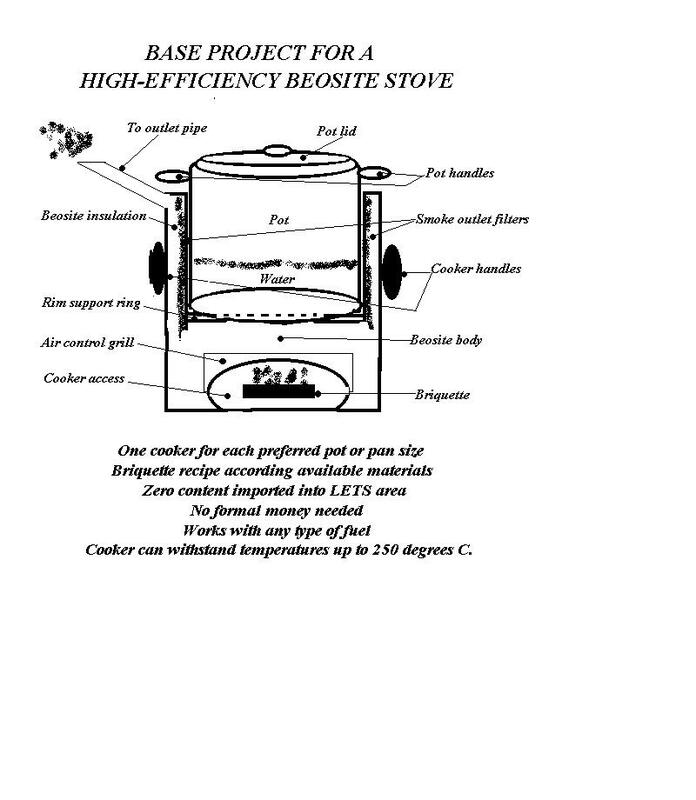 DRAWING OF TYPICAL HIGH EFFICIENCY STOVE. The structures foreseen are for the production of mini-briquettes for the stoves to be made by the gypsum composite production units and for the production of bio-masse to make the mini-briquettes. The bio-mass production for mini-briquettes will be combined with the production of pure plant oil for small-scale use for electricity generation and to run adapted Diesel motors. This multi-functional approach is expected to improve the incomes of the bio-mass producers. Some crops produce edible oils. Many oils and press-cakes can also be used to feed animals. They can also be used to make household necessities including soaps. One Moraisian workshop will be held in the project area. At least one representative of the ONG. 50 persons indicated by the tank commissions interested in the production of mini-briquettes. 200 persons indicated by the tank commissions, interested in producing bio-masse for the mini-briquettes. - definition of the social form. - professional and administrative structures. - financial aspects including payments. - relations with the local money LETS systems. - detailed analysis of the present systems. - demand in the project area. - demand outside the project area. c) Analysis of the bio-masse resources available. d) Definition of the recipes (mixtures) socially acceptable. e) Creation of the physical structures for briquette production. - Assembly and stocking of materials. g) Organisation of the cultivation of bio-mass. - Availability of micro-credits for growers. - Availability of micro-credits for briquette makers. - Prices for briquette distribution according to the various mixtures. Forward: On-going maintenance of project structures. Back: Production of mini-briquettes for high-efficiency stoves.